officials, and an increased w-axis speed reduces positioning time between holes and electrode-exchange time, boosting overall small-hole production. The drill features a M730-series Mitsubishi control, which provides the flexibility to run more advanced programming, and a Windows XP-based touchscreen display. A collet-type chucking system provides dependable clamping of smaller electrode tubes, and a constant processing circuit reduces and improves wear characteristics of the electrodes. It comes with a Mitsubishi MELFA robot that controls a 20- or 40-position automatic electrode changer and 10-position guide changer for quick tool changing during production. The new power supply, fine-tuned for small-hole applications, offers wider range and finer steps in electrical-power-setting adjustments than previous models. 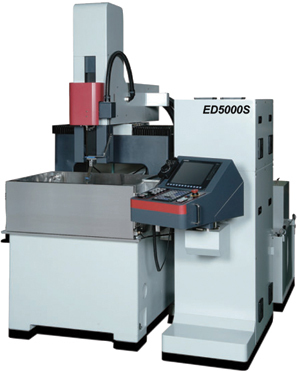 The machine also is available as a stand-alone unit—the ED5000S shares all of the features and programming benefits of the ED6000S without the automatic tool changer and guide changer.